Meet John Doe (1941) is Frank Capra's wonderful, message-laden populist melodramatic tale about the common man. The sentimental, hard-hitting film is often grouped into a populist trilogy of Capra films about American individualism - associated with Mr. Deeds Goes to Town (1936) and Mr. Smith Goes to Washington (1939), although it is generally considered the weakest of the three. The socially-conscious film was Capra's first independent film production - and a departure from his traditional, twelve year association with Columbia Studios and tyrannical studio head Harry Cohn during the 30s. It was much more serious than his previous 'Capra-corn' comedic efforts, such as It Happened One Night (1934) and You Can't Take It With You (1938). 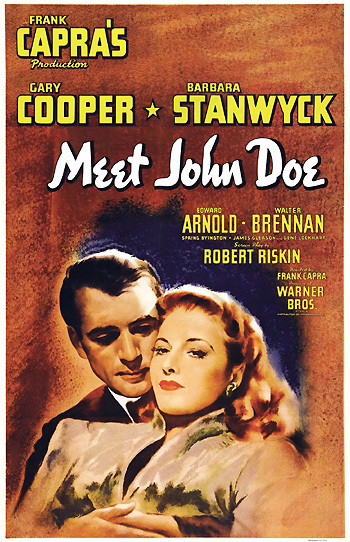 The screenplay, written by screenwriter Robert Riskin, was derived from a 1939 film treatment, titled The Life and Death of John Doe, written by Richard Connell and Robert Presnell (the recipients of the film's sole Academy Awards nomination for Best Original Story). The treatment was based upon Connell's 1922 Century Magazine story titled A Reputation (collected in Apes and Angels). With all-time persuasive performances by both Barbara Stanwyck and Gary Cooper, this sobering film remains an important social commentary. Cooper won the Best Actor Oscar for his performance in Sergeant York (1941) in the same year. Stanwyck's role as a sassy journalist (similar to Jean Arthur's part in Mr. Smith Goes to Washington (1939)), was originally considered by actresses Ann Sheridan and Olivia de Havilland. The film was intended to combat pro-Nazi Fascist forces present in America with its story of a young female newspaper reporter (Barbara Stanwyck) who writes a fraudulent column after threatened with being fired. In the spoof, she invents a fictitious reader as the author of a letter - a suicide-martyr who protests against an injust political and social system. And then because of public interest and demand (and soaring newspaper sales), she incarnates an American ex-minor-league baseball player/hobo (named John Doe - an Everyman character) to sell his services as an imposter and impersonate the non-existent character. The has-been tramp preaches charity, kindness, plain-speaking, homely aphorisms, and a doctrine of good-neighborliness. He becomes a national figure, and causes the spread of 'John Doe Clubs' across the country. The benevolent, empowering fraud is eventually uncovered (and opposed by corrupting, unscrupulous political influences), and Doe is forced to publicly admit the charade. As the film opens, a struggling, sassy newspaper columnist Ann Mitchell (Barbara Stanwyck) is threatened with being fired (along with many others who are considered "deadwood" after a change in the paper's ownership) by her new managing editor Henry Connell (James Gleason) because her writing has too much "lavendar and old lace" and lacks "fireworks." [During the scene, a sign painter struggles to paint the name of Henry Connell on his office door - eventually, he scribbles out the name after becoming totally exasperated with all the comings and goings.] Her metropolitan newspaper, The Bulletin, has recently been bought and is renamed The New Bulletin by right-wing tycoon and high-pressured financier-publisher D. B. Norton (Edward Arnold). The 1862 paper's motto is chiseled off the front of the newspaper offices and changed from: "A FREE PRESS MEANS A FREE PEOPLE," to a face-plate plaque reading "A STREAMLINED NEWSPAPER FOR A STREAMLINED AGE." Norton's major intention is to ruthlessly stimulate circulation. Attempting to save her job on her last day because she supports both her mother and two younger sisters, the normally-tame and subdued columnist spitefully writes a fiery last column as a publicity stunt. Her face glows above her typewriter as she fabricates a letter to the editor, written by an imaginary, idealist underdog "John Doe" character, in which "the disgusted American citizen" protests against four years of his own unemployment, hypocrisy, greed, inhumanity and other injustices, miseries and mistreatments suffered by the nation's poor on account of big business tycoons, corrupt moguls and slimy politicians. To make a statement, her "John Doe" also promises to commit suicide by jumping from the roof of City Hall on Christmas Eve. Below is a letter which reached my desk this morning. It's a commentary on what we laughingly call a civilized world. Four years ago, I was fired out of my job. Since then, I haven't been able to get another one. At first, I was sore at the state administration because it's on account of the slimy politics here. We have all this unemployment. But in looking around, it seems the whole world is goin' to pot. So in protest, I'm goin' to commit suicide by jumping off the City Hall roof. Signed, a disgusted American citizen. John Doe. Editor's Note: If you ask this column, the wrong people are jumping off the roofs. There is much publicity, uproar and ruckus following its publication (in the offices of the Governor (Vaughan Glaser), the Mayor (Gene Lockhart), the Chamber of Commerce and others) - and newspaper circulation improves. City Hall is flooded with offers of housing and employment (and pleadings to John Doe to abandon his plan to kill himself). There are also charges of fraud ("amateur journalism") from a rival newspaper (the Daily Chronicle). Connell puts out an all-points search to find Ann (described by Connell as "'bout five-foot-five, brown eyes, light chestnut hair, and as fine a pair of legs as ever walked into this office") to help identify the man who wrote the letter. As he finishes the description on the phone, Ann appears at his door. When the letter is demanded, Ann tells them it is only a phony letter ("There is no letter, I made it up") - the "fireworks" they asked for. To save face and safeguard her job, she suggests that she can continue to play up the story every day and sell more newspapers: "This is good for at least a couple of months." He [John Doe] wants to get a few things off his chest and that's the only way he can get himself heard...So he writes me a letter and I dig him up. He pours out his soul to me. From now on, we quote: "I PROTEST" - by John Doe. He protests against all the evils in the world - the greed, the lust, the hate, the fear, all of man's inhumanity to man. Arguments will start. Should he commit suicide or should he not? People will write in, pleading with him - but NO! No sir, John Doe will remain adamant. On Christmas Eve, hot or cold, he goes. See? Ann is dismayed that her earnest and practical idea isn't immediately embraced: "If it was raining hundred dollar bills, you'd be out looking for a dime you lost someplace." The reluctant managing editor is eventually impressed and convinced that they should recruit and hire an unemployed hobo as a bogus hero (who can claim he wrote the letter) so they can fulfill the public's interest in an "typical average man" hero for the little man. He would be a Messianic figure of sorts. And Ann finagles her job back (her "meal ticket"), with a $1,000 bonus. He's perfect, a baseball player. What could be more American?...that face is wonderful. They'll believe him...That's our man, he's made-to-order. All this John Doe business is batty if you ask me...Trying to improve the world by jumping off buildings. You couldn't improve the world if the buildings jumped on you. The two perform a duet of the William Tell Overture tune. (John plays the tune on a harmonica while the Colonel plays a musical instrument called an ocarina!) They are provided with a luxurious Imperial Hotel suite (with bodyguards), new clothes, and spending money, while Ann continues to ghost-write the column to help bolster circulation. The anti-establishment, anti-materialistic Colonel warns John about the corrupting, decadent influence of money and luxury: "You're gonna get used to a lot of stuff that's gonna wreck ya...I've seen guys like you go under before, guys that never had a worry. Then they got ahold of some dough and went goofy." In a marvelous monologue, he has a term for people who are corrupted by wealth - they're heels or "heelots." And when they got ya, you've got no more chance than a road rabbit...You're walkin' along, not a nickel in your jeans, you're free as the wind. Nobody bothers ya. Hundreds of people pass you by in every line of business. Shoes, hats, automobiles, radios, furniture, everything, and they're all nice loveable people. And they let you alone. Is that right? Then you get ahold of some dough and what happens? All those nice, sweet, lovable people become heelots. A lotta heels! They begin creepin' up on ya, tryin' to sell ya something. They get long claws and they get a stranglehold on ya and ya squirm and ya duck and ya holler and ya try to push 'em away, but you haven't got a chance. They've got ya. The first thing you know, you own things - a car, for instance. Now your whole life is messed up with a lot more stuff. You get license fees and number plates and gas and oil and taxes and insurance and identification cards and letters and bills and flat tires and dents and traffic tickets and motorcycle cops and courtrooms and lawyers and fines - and a million and one other things! And what happens? You're not the free and happy guy you used to be. You've gotta have money to pay for all those things. So you go after what the other fella's got. And there you are - you're a heelot yourself. Circulation and sales of the New Bulletin newspaper escalate over the months, shown in an animated chart, doubling up to 275,000. The columns inspire citizens to "march on city hall and state capitol" to institute change in the Mayor's and Governor's offices and create "a clean city" and a "clean government." The governor, who suspects that the whole "John Doe" has been a phony set-up and "engineered by a vicious man with a vicious purpose," demands that Norton schedule a public appearance of John Doe. The first view of D. B. Norton - the influential, self-interested, would-be 'vicious' politician (and fifth-column Fascist leader) - is on horseback as he watches his own black-jacketed para-military corps of motorcycle corps (the D. B. Norton Motor Corps) conducting maneuvers on a field. His intentions are to expand his power base, "crash national politics," and "reach a lot of people." [One of his lieutenants commands his men with a police whistle.] Knowing that she will profit from John Doe's exposure, Ann pressures Norton to put the larger-than-life Doe on the radio (a Norton-owned station): "He can say anything he wants and they'll listen to him...This can arouse national interest. If he made a hit around here, he could do every place else in the country - and you'll be pulling the strings, Mr. Norton." As Norton wipes and cleans his glasses [here and at other crucial junctures in the film], he questions her career intentions and learns that she cynically wants only "money." To smoothly exploit her, he proposes a raise (and financial security) from $30/week to $100/week if she agrees to script a radio speech for John Doe: "That's only the beginning. You play your cards right and you'll never have to worry about money again." Playing matchmaker, he introduces her to Ted Sheldon (Rod La Rocque), his handsome "Casanova" nephew. At her typewriter, Ann finds herself "stuck" and at a loss for words for John's radio speech - her wastebasket is stuffed with failed script attempts: "I created somebody who's going to give his life up for a principle. Hundreds and thousands of people are going to listen to him over the radio. And unless he says something that's - well, that's sensational, it's just no good." Her widowed, kindly mother (Spring Byington), who was married to her philanthropic father Dr. Mitchell who served the needy common people, suggests that the speech that she is writing shouldn't be one of those "complaining political speeches. We're tired of hearing nothing but doom and despair on the radio." Mrs. Mitchell proposes that it be "something simple and real, something with hope in it." She finds her husband's leatherbound diary and entrusts it to Ann: "There's enough in it for a hundred speeches, things people ought to hear nowadays." John soon becomes uneasy with the manufactured role and the whole phenomenon when he realizes that he may never be able to play big-league baseball again, even if his arm is treated, if people discover his fakery: "...you know how they are in baseball. If a guy's mixed up in a racket...I was just thinking about this John Doe business. Why, as soon as it comes out it's all a fake, you'll be washed up in baseball, won't ya?...And another thing, what about all the kids in the country - the kids that idolize ball-players? What are they gonna think about ya?" confess the hoax, say the "whole thing is a frame-up," and admit being an imposter after accepting a $5,000 bribe from the Chronicle to "tell the truth" and read an alternate speech ? vindicate the New Bulletin and prove that the John Doe thing isn't a hoax ? deliver Ann's scripted speech taken from idealistic, philosophical, and populist maxims and thoughts in her late father's diary ? follow the advice of the Colonel to get out of his dilemma and avoid the coming of the heelots ("The elevators are still running" for their escape) ?